Our animated ghost is like no other. 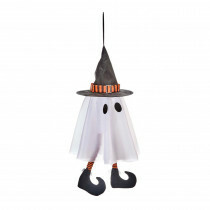 It comes with a loop to hang and kicking legs to either scare the trick or treaters or make them laugh. It sure is the perfect Halloween decoration.